Je n'ai regardé ni Dexter ni Breaking Bad. I haven't watched either Dexter or Breaking Bad. I have neither watched Dexter nor Breaking Bad. I haven't watched Dexter or Breaking Bad. Je ne veux ni chanter ni danser. I neither want to sing nor dance. When using ni, you omit the article after ni, unless you're talking about general things and using le, la, l', les. You can also use the expression "ni" more than twice. He has neither brothers nor sisters nor cousins. "J'aime jouer du piano et de la guitare"
"Je n'aime jouer ni du piano ni de la guitare." Here, will the articles du and de la remain or will they get removed? Because in the lesson it is stated that All articles except the definite articles will be omitted. But I think jouer du piano and jouer de la guitare are fixed expressions in French so there should be no change in their structure. You are correct - Well done! Comemnt introuduit ça avec < ne..ni..ni > 1.Nous n'avons reçu aucune lettre, aucun fax, aucun appel téléphone. 2.Il n'y a pas de pommes, pas de poires, pas de raisins. 3.Il n'était pas présent à la réception, le directeur, non plus. 4.Ce n'est pas autorisé, ce n'est pas toléré non plus. Introduisez, SVP ! Bonjour Crystal ! In general, to complete this exercise, you will need to replace the negative words "pas"/"aucun" with "ni". 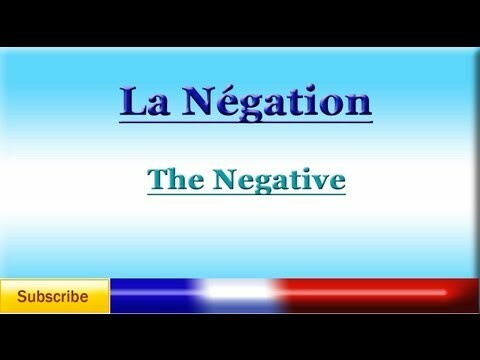 Remember that "ni" won't keep "de" afterwards, and also applies to the negated elements (in the case 3, the negated elements are "il" and "le directeur", therefore you need to say "Neither him nor the director...") I hope that's helpful! À bientôt ! Nick asked: "Why is "Non, il n'a pas vu Paul ou Sam" incorrect?" Isn't there a subtle difference between "No, he hasn't seen Paul or Sam" vs "No, he has seen neither Paul nor Sam"? I agree that in English you could indeed use either "No, he hasn't seen Paul or Sam" or "No, he has seen neither Paul nor Sam" with very little alteration of meaning, however in French, the correct way to express this idea of "multiple negated elements" is by using "ni...ni...". Shouldn't you change the english sentence into "No, he hasn't seen neither Paul nor Sam"? I made the same "error" answering because I didn't feel I need "ni... ni..." here.